I love going to the movies. I love watching movies at home ~ some of my favourites, I’ve watched so many times that I can recite each and every line (a major annoyance for anyone enjoying the movie alongside of me) and I love it when a good movie makes me stop and think. Last night I enjoyed one of those “stop and think” movies. 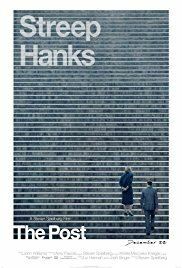 I had the pleasure of seeing “The Post” which stars Meryl Streep as Katharine Graham, the Washington Post newspaper heiress (reluctantly as the helm of the paper following the death of her husband) and Tom Hanks as Ben Bradlee, the paper’s editor-in-chief. As the movie opens, Streep is almost unrecognizable as the unsure of herself, unorganized and unprepared to be in her current position of authority Graham. Her character stumbles to present her case and defers decisions and actions to the male members of the board. For those of us who have loved Meryl in so many “strong” roles it was indeed painful to watch. But then at the pivotal moment when the decision to either go to press or bury the story occurs, her character’s strength shines through, ever so quietly, but ever so powerfully. It was at that moment that I wanted to stand up and cheer, “Finally”. As the story line draws to a conclusion there is a visible change in how Graham holds her head, stops fidgeting with her glasses and evolves into a less timid, less compliant woman. And although it is Graham’s transformation during a time in our history when women weren’t invited to the “Big table” in business ~ every so beautifully portrayed in one scene following a dinner party, when the woman automatically retire to the drawing room to discuss decorating while the men (most of whom answer to Graham) engage in business dialogue ~ that was the central theme, it was the portrayal of Ben Bradlee’s 10 year old daughter that gave me cause to stop and think. As with most historical fiction movies, one is never sure if the supporting cast members are portrayed as true to life or included for creative flair and effect. So the part of Ben’s daughter may have been an actual depiction or added for flair. 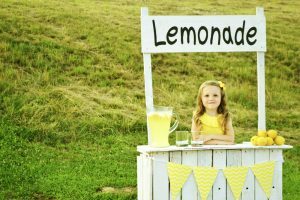 As the news crew transitions from the Washington Post head office to Ben’s home to work through the story, they are greeted by Ben’s daughter (Marina) who is selling lemonade (a well know past time for those of us who grew up in the ‘70s). The audience giggles as there is a reference to adding something a stronger to the lemonade. A few scenes later as the mood intensifies and the living room is strewn with piles and piles of notes, Marina flows in with a plastic jug of lemonade and starts to refresh glasses. I’ll admit that my prediction skills kicked in and I anticipated spillage of lemonade and a room full of anxious newsman rushing for paper towels. You’ll have to watch to movie to see what happens. As the storyline nears the end, there is a shot of a stack of dollar bills ~ Marina’s earnings for the day. Laughter from the audience followed, as Ben Bradlee’s wife places the money in a wooden box. Although I thoroughly enjoyed the movie and was thrilled that Streep’s character came into her own by the final few scenes, it was the image of Marina’s earnings that stuck with me on the way home. It was almost as if director Spielberg was giving us hope in the next generation. A generation where women could be entrepreneurial, ingenious and inventive. A generation where women like Graham didn’t need the approval of the male dominated board of directors to make a decision. A generation where women no longer retired to the dining room while the men talk about business ~ they were there, in the thick of it ~ giving birth to their own business.